On 1/17/13 I found myself drifting along one of my favorite runs on the South Umpqua River in pursuit of trophy winter steelhead. Good friend Brady Rogers, as usual, was nice enough to row Steven Theel and I all day, putting us on 3 beautiful early winter steelhead. We caught all of our fish on a combo of yarn and Pautzke Borax O Fire egg clusters, cured by yours truly! I reeled in 1 that hit the measure boards with a length of 36 inches and a girth of 19 inches. A 3 foot steelhead! Steven also reeled in 2 beautiful steelies, including one of the mystical hatchery fish that aren't caught very often in the Umpqua watershed. What an epic day winter steelheadin' with good friends! I offer trips on the South Umpqua until the end of February, where I then turn my attention to the upper Rogue River for winter steelhead continuing through the end of April. Give me a call or email me and we'll get you tied into one of these trophy winter steelhead that Southern Oregon rivers' have to offer! 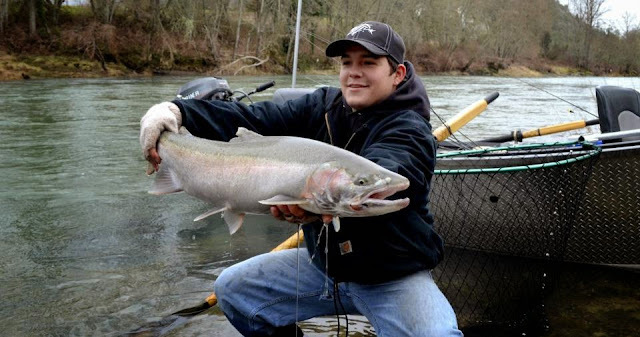 Tophy Winter Steelhead caught side drifting the S. Umpqua River! Steven's beautiful native steelhead caught and released on 1/17/13! This hatchery fish is a rewarding bonus while fishing anywhere on the Umpqua River!